Simple Nitrox blender. The perfect solution for the private individual. 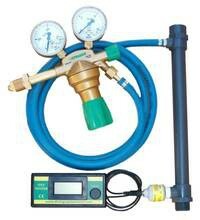 The gas injection is made trough a manoregulator gone up the gas tank and a flow regulator which are supplied.